London - South African athlete Anrune Liebenberg has won a silver medal in the women's 400m T46 final at the London Paralympics. 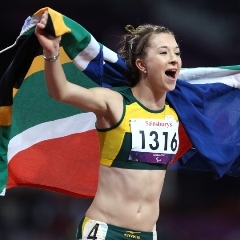 It was Liebenberg's second medal after she claimed bronze in the 200m T46 final. She clocked a time of 56.65 seconds, setting a personal best to claim the silver medal behind gold medalist Yunidis Castillo of Cuba. Alicja Fiodorow of Poland finished in third place.